The rich navy and gold of the Allyce collection by Croscill will have you sleeping in luxury at an affordable price! This collection includes everything you need to transform your room. Comforter sets, drapery panels, throw pillows, and valance treatments are everything you need to update your space! 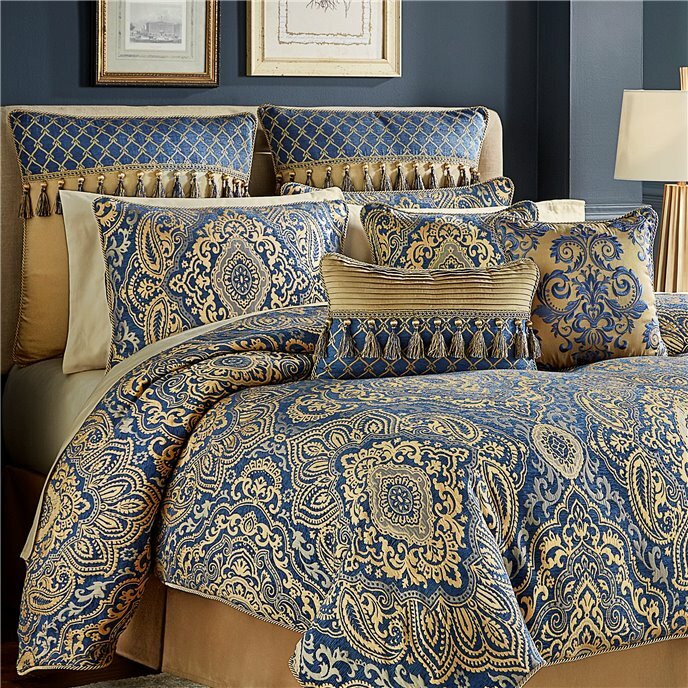 The beautifully adorned comforter set features a golden damask print that pops from the more neutral navy background. Use the coordinating jacquard curtains to tie everything together. The accent pillows feature intricate detailing like tassels and a reverse fabric with gold as the background, so you can mix and match and create a custom look for your room. Croscill has produced high quality bedding at an affordable price for more than 50 years. The Allyce Bedding Collection features a rich and lavish chenille jacquard in blue and gold. The comforter and shams feature a chenille jacquard and are trimmed in a big twist cord. The bedskirt features a rich looking faux silk. One (1) Queen Comforter, two (2) Standard Shams, one (1) Bedskirt 15in drop, Comforter measures 92x96, polyester fabric and poly fiber fill, dry clean recommended, imported. Manufactured by Croscill. The Allyce Bedding Collection features a rich and lavish chenille jacquard in blue and gold. The comforter and shams feature a chenille jacquard and are trimmed in a big twist cord. The bedskirt features a rich looking faux silk. One (1) Cal King Comforter, two (2) Standard Shams, one (1) Bedskirt 15in drop, Comforter measures 110x96, polyester fabric and poly fiber fill, dry clean recommended, imported. Manufactured by Croscill. The Allyce Bedding Collection features a rich and lavish chenille jacquard in blue and gold. The comforter and shams feature a chenille jacquard and are trimmed in a big twist cord. The bedskirt features a rich looking faux silk. One (1) King Comforter, two (2) Standard Shams, one (1) Bedskirt 15in drop, Comforter measures 110x96, polyester fabric and poly fiber fill, dry clean recommended, imported. Manufactured by Croscill. The Euro Shams feature an ogee jacquard, rich looking faux silk and is embellished in a tassel fringe. The sham reverses to the ogee jacquard and is trimmed in a delicate twist cord. One (1) European Sham, Measures 26x26, polyester fabric, dry clean recommended, imported. Manufactured by Croscill. The Allyce 18” x 18” Square Pillow features the exquisite chenille jacquard. The pillow reverses to the faux silk and is trimmed in a twist cord. One (1) Square Pillow, Measures 18x18, polyester fabric and poly fiber fill, spot clean recommended, imported. Manufactured by Croscill. The Allyce 20” x 12” Boudoir features the faux silk in a pleated design with the ogee jacquard and a tassel fringe. The pillow reverses to the faux silk and is trimmed in a delicate twist cord. One (1) Boudoir Pillow, Measures 20x12, polyester fabric and poly fiber fill, spot clean recommended, imported. Manufactured by Croscill. The Allyce 16” x 16” Fashion Pillow features the faux silk with a beautifully designed embroidery embellishment. The pillow reverses to the faux silk and is trimmed in a delicate twist cord. One (1) Fashion Pillow, Measures 16x16, polyester fabric and poly fiber fill, spot clean recommended, imported. Manufactured by Croscill. The Allyce Curtain Panel Pair features an allover ogee jacquard with coordinating tiebacks in the same ogee jacquard. Each panel is lined with a solid white polyester lining and include encased weights in the bottom hem. Two (2) Window Panels, two (2) Tiebacks, Measures 82Wx84L, polyester fabric, dry clean recommended, imported. (Second image shows swag valance that is sold separately.) Manufactured by Croscill. The Allyce Curtain Panel Pair features an allover ogee jacquard with coordinating tiebacks in the same ogee jacquard. Each panel is lined with a solid white polyester lining and include encased weights in the bottom hem. Two (2) Window Panels, two (2) Tiebacks, Measures 82Wx95L, polyester fabric, dry clean recommended, imported. (Second image shows swag valance that is sold separately.) Manufactured by Croscill.